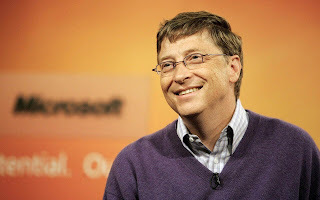 Microsoft cofounder and world's richest man Bill Gates could become world's first trillionaire in some years to come. The tech genius had clearly mastered the art of money making. That seemingly elusive skill that men hunt for all their lives. Gates is already the richest man in the world, but that is mere pennies compared to what he could be making in the next 25 years— trillions! I'm sure you'll agree with me—it's a mind blowing notion, and yet true. Recently, the Microsoft cofounder networth increased by $10 billion, and he is now worth a hair raising $85billion, according to Forbes. But here is the amazing thing—If Gates' wealth continues to appreciate at the rate of return it has been for the past decade, then by the time 61-year-old turns 86, he should be worth a trillion dollars. Yes that's a pretty long time, but he might just achieve it. This calculation is based on the financial fact that the ultrarich has been enjoying an average rate of return of 11 percent since 2009, says the poverty-research group. Incredible for an individual, and impressive even for some countries. You must understand this: the calculation is still possible even with the billions Gates has given away to charity. This might shock the socks off you, but as of 2013, Gates had given away $28billion of his wealth to charity through his Gates Foundation, which helps to fight worldwide poverty.